We will attend the April 25th, 11:45 a.m. luncheon at Alpha Beta Room at Watertower Place, 303 S. Santa Fe Ave. Park in lot facing Santa Fe Ave.
Reservations must be received by 4 p.m. Monday, Mar. 25th. a few are breakfasts. Be sure to check time. Meeting information is subject to change. April 25, 11:45 a.m., Alpha Beta Room at Watertower Place, 303 S. Santa Fe Ave. Program: Update on this redevelopment. June 27, 11: 45 a.m. 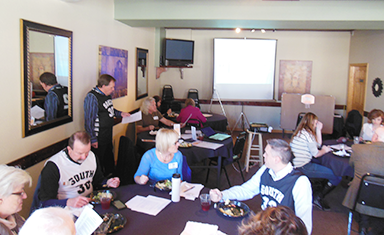 If your business or organization would like to sponsor a Pueblo Downtown Association general meeting, or if you have a topic of interest to our membership that you would like to present at a general meeting, call Margaret at 719-543-7155. ​is to see you there! Our general meetings are open to everyone but we want to invite you to join us as a member. Click here for a membership brochure/application. 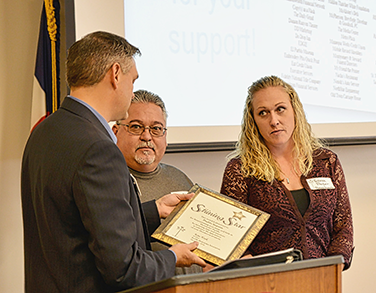 Our October 2016 Shining Star was presented to the Leadership Pueblo 2016 class. Their class project was refurbishing the Pueblo Soup Kitchen. T. J. Wright presents Shining Star award for property improvement to owners of Pueblo Imports on W. 4th St. Officer Brandon Beauvais addresses October meeting. Dr. Mike Wakefield presented ideas for a high tech business incubator proposed for the basement (Riverwalk level) of the PBR building. The July meeting was held in the historic Elks Lodge No. 90 building. A Shining Star award was presented in July to P.S., I Love You Flowers & Gifts for their lovely and creative treatment of the exterior of the former Taco Bell building at 8th & Santa Fe. 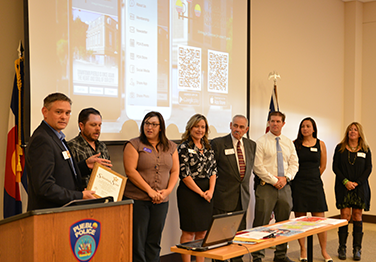 P.S., I Love You has since joined the Pueblo Downtown Association. It's great to have a flower & gift shop downtown! D.A. Jeff Chostner outlined his plan to increase police presence in Pueblo. The May 2016 meeting was held at Willie's BBQ on West 13th Street. Our PDA slide show running at Chostner's left promoted Downtown Madness, the PDA restaurant promotion. Early in June, it was announced that Willie's came in second in the tournament-style competition. 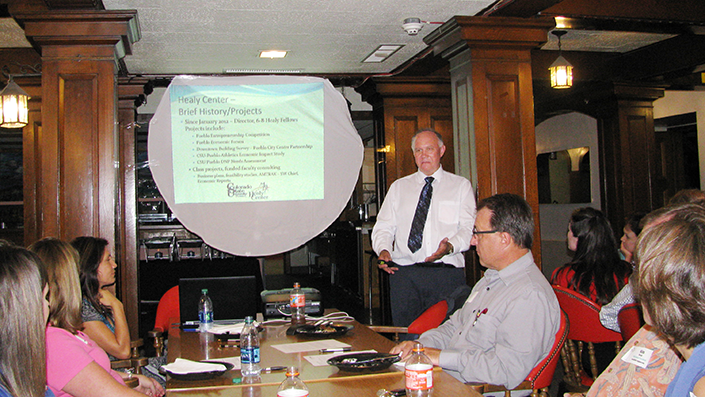 Gus Sandstrom presented Pueblo's Riverwalk expansion plans at the April 2016 meeting. Tammy Fesmire called the April meeting to order. Donna's All Seasons Catering hosted the event. 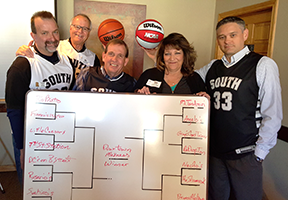 Team members John Myers, Mike Carlisle, Kim Kock, Peggy Willcox and T.J. Wright donned basketball jerseys and scored with their presentation of our bracket-style Downtown Madness restaurant promotion at the March 2016 meeting at Angelo's Pizza. June 1 update: Downtown Madness goals have been exceeded as hundreds of diners have cast ballots for their favorites of the "Eat 16", "Great Ate" and now the "Final Fork" participating restaurants. The championship round wrapped up May 31st. The winner was Gray's Coors Tavern. Runner-up was Willie's BBQ. At the February 2017 meeting, Paulette Stuart and Don Gray filled us in on plans for the upcoming Medal of Honor Recipients Convention. Jamie Burt of Sunflower Bank, Mike Carlisle and T.J. Wright draw names to choose restaurant pairings for our 2017 Downtown Madness restaurant promotion. The Gray family has owned and operated Gray's Coors Tavern for many years. They were winners of last year's Downtown Madness promotion. Mary participated in our Dancing with the Pueblo Starz competition. To show our appreciation for their support, we were happy to name them 2017 Downtowner of the Year for Business. T. J. Wright of ABC Bank created and spearheaded our successful Downtown Madness promotion last spring. He'll be leading the team for the new and improved 2017 Madness event. Thanks T. J.! You deserve the PDA Board Member Downtowner of the Year Award. Many thanks to our go-to guy Bill Zwick. Bill is Capital Projects Manager for the City of Pueblo and has helped us with many of our outdoor enhancement projects. He received our 2017 Downtowner of the Year for Government. The Showroom at Rampart Supply received our 2017 Downtowner Award for Property Improvement for their beautiful store at 4th & Santa Fe. Our unending thanks to the Pueblo County Historical Society for their assistance and the use of their photos for our Historic Downtown calendars, banners, etc. We were happy to present them with the 2017 Downtowner Award for Community Service. Our January 2017 meeting was held at Brues Alehouse. A good crowd turned out for the annual Downtowner of the Year awards. Winners are pictured above. Renewed Wholesale at South Main and Abriendo received our Shining Star property improvement award for January 2017. Congratulations to the Weber family! Derrick Martinez was awarded the Shining Star for Property Improvement for Express Employment Professionals for the beautiful redo of their new location on West 6th Street. 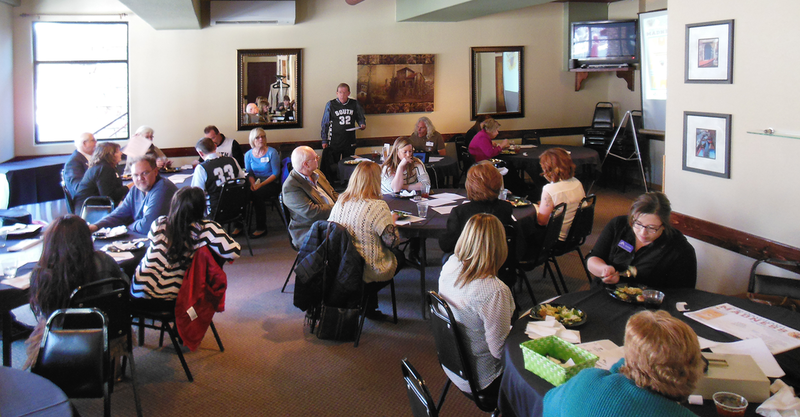 Below, Tammy Fesmire and Peggy Willcox emceed our January meeting. 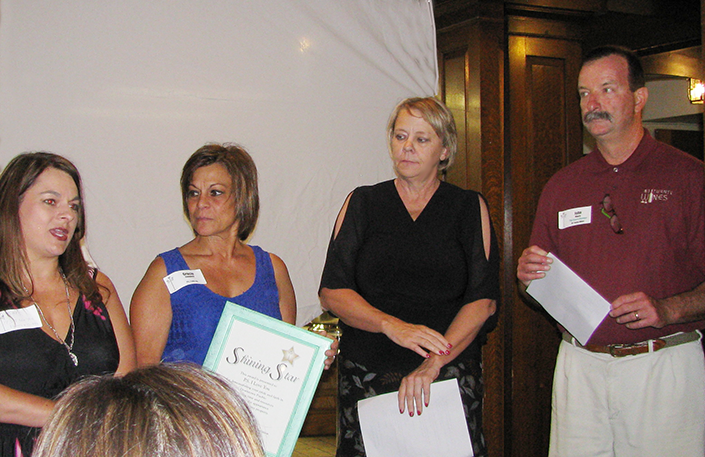 We were happy to present a Shining Star award and our Downtowners of the Year awards. 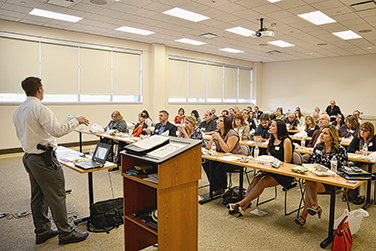 Kerry Gladney and Tom Bruss start the November 2015 meeting in the Bernstein Room at the Pueblo Convention Center. 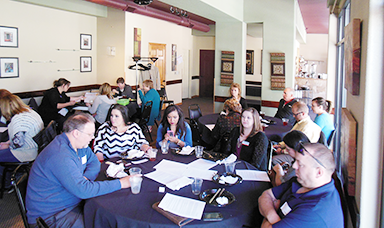 Black Hills Energy explained their policies our August 2016 breakfast meeting which was moved inside from the Gray's Coors Tavern patio when the morning was chilly. We missed the opportunity to enjoy breakfast outdoors, but, as always, the food was delicious. Gray's Coors Tavern was the winner of our spring Downtown Madness competition. or unusual tree and plant specimens. At our June meeting at El Pueblo History Museum, actor Michael Stewart informed us of the movie Canyon Trail which was filmed near Westcliffe. Board member April Kasza at the January 2015 meeting. 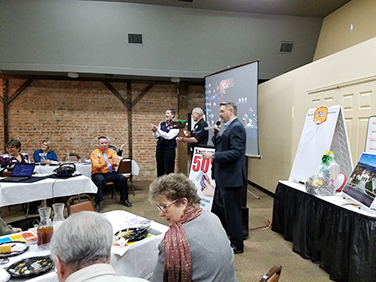 ﻿﻿Mike Carlisle and John Myers, hosts for the monthly meeting, presented the Shining Star award to Joe Aldaz, director of the Center for American Values. The organization decorated the Waterfront Building with American flags for the Memorial Day holiday. October meeting at Sangre de Cristo Arts Center. Pueblo County Commissioner Sal Pace informs our October meeting about the ways funds raised by a proposed new marijuana tax would enhance our communities.